On Saturday, June 20th, in the occasion of the “World Refugee Day”, the Migration Center “Mirekoc”, Koc University will hold a special event “PhotoShow and Documentary Premiere” to critically engage with Turkey, EU and other States, and main actors’ responses to the Syrian refugee crises. According to the latest inter-country report of the U.N. Office for the Coordination of Humanitarian Affairs (OCHA), issued on May 7th, 2015, the humanitarian crisis has reached an unprecedented scale: 7.6 million people are internally displaced in Syria, while more than 3.9 million are seeking protection in neighboring Jordan, Lebanon, and Turkey. The recent Syrian refugee critical situation presented unprecedented challenges and intensified the debates on migration law in Turkey: What is the status of refugees and asylum seeker? Whose responsibility is it to help them? What rights do they have? And how should the financial responsibility be shared? The event will feature a Photo Show and a Documentary focusing on the impact of the Syrian crisis on Turkey, as a neighboring country, and Turkey’s response to it, followed by a Q&A discussion. Registration is free and available by RSVP at giorgi82@gmail.com or by “Attend” at the Facebook event. Refreshments will be provided for all who register. We look forward to seeing you on June 20th. The Institute of Human Rights of the University of Deusto is pleased to announce the third scientific thematic workshop organized by the working group on “Identity and Cultural Integration” in the framework of the 7FP Training Network “Integration and international migration: pathways and integration policies”. Looking at the development of migration studies and diversity management of the past decades, one issue that has gained increasing attention is what has been called “methodological ethnicism” or “methodological nationalism”. What researchers define as the “others” who are said to challenge existing bonds of nationhood have gone from “tribal” people and indigenous communities to the migrants, who are the new ethnics. What has remained unchanged, however, is the tension between what is “real” and what is “invented” by the entrepreneurs of ethnicity. The fiction of a mainstream (the receiving society) which is non-ethnic (or a-ethnic) and yet characterized by a singular culture is still largely used as a benchmark for integration policies and discourses, while the main trait emphasized to define group membership for migrants is seen as being rooted in their ethnicity, which is supposed to define their culture. This workshop aims at exploring the tension between the concepts of ethnicity and culture with the aim of questioning how migration and integration studies can constructively contribute to this debate without reinforcing ascribed otherness or reifying cultural essentialism. We are particularly interested in how understandings of belonging and un-belonging have been re-shaped during the various crises currently affecting Europe. We therefore welcome papers by PhD candidates and early scholars working on these topics. Please send a short abstract (max 300 words) by April 30, 2015 to (Dolores.morondo@deusto.es). 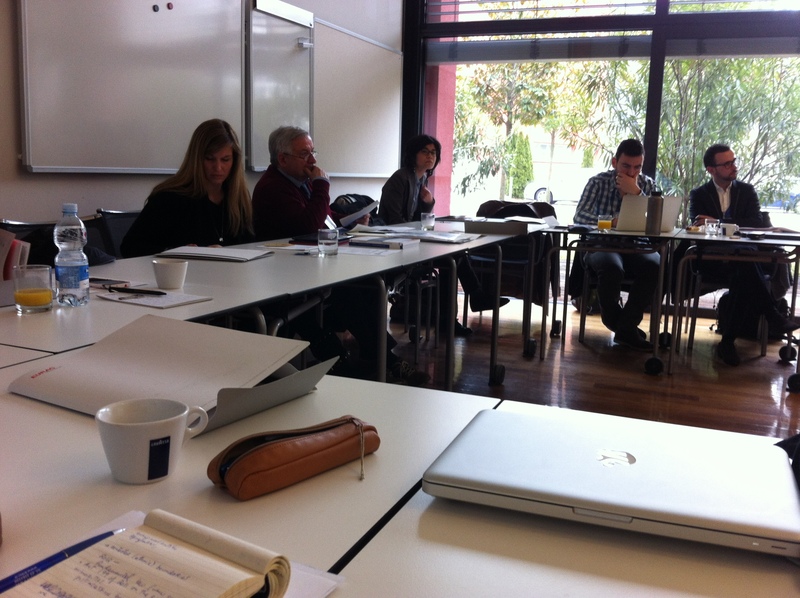 The intention is to prepare a special issue of a journal including a selection of the papers presented at the workshop. The workshop will be opened by two lectures: “Antisemitism and Islamophobia. Two faces of discrimination?” by Alberto SPEKTOROWSKI (Political Science Department, University of Tel Aviv), and “AMORE : Awareness & Migration: Organizations for bi-national-family Rights Empowerment ” by Laura ODASSO (Marie Curie Fellow, Group for research on Ethnic Relations, Migration and Equality, Université Libre de Bruxelles). Looking at the development of migration studies and diversity management of the past decades, one issue that has gained increasing attention is what has been called “methodological ethnicism” or “methodological nationalism”. What researchers define as the “others” who are said to challenge existing bonds of nationhood has gone from “tribal” people and indigenous communities to the migrants, who have become the new ethnics. What has remained unchanged, however, is the tension between what is “real” and what is “invented” by the entrepreneurs of ethnicity. The fiction of a mainstream (the receiving society) which is non-ethnic (or a-ethnic) and yet characterized by a singular culture is still largely used as a benchmark for integration policies and discourses, while the main trait emphasized to define group membership for migrants is seen as being rooted in their ethnicity, which is supposed to define their culture. This workshop aims at exploring the tension between the concepts of ethnicity and culture with the aim of questioning how migration and integration studies can constructively contribute to this debate without reinforcing ascribed otherness or reifying cultural essentialism. We are particularly interested in how understandings of belonging and un-belonging have been re-shaped during the various crises currently affecting Europe. The Workshop is open to professors, lecturers, researchers, PhD candidates and staff from organizations, institutions and public administration with an interest in human rights, diversity management policies, integration policies, public law and political science. Registration is free but required and it includes participants’ lunch. English is the working language and no translation service is available. Antisemitism and Islamophobia. Two faces of discrimination? The Centre for Ethnic and Migration Studies (CEDEM) of the University of Liège is pleased to announce the third scientific thematic workshop organized by the working group Citizenship and Political Participation on “Religion and the Political Participation and Mobilization of Inmigrant groups. A transatlantic perspective ”. According to the last European Agenda for the Integration of third-Country Nationals, migrants should participate fully in all aspects of collective life. The European Commission has recognized that migrants’ participation in the democratic process is important for their integration and that the implementation of integration policies allowing their political participation and their involvement is crucial for integration. The scientific thematic workshop will examine the political participation of immigrants in an original perspective. Instead of analyzing it through an exclusive ethnic and racial origin lens, we will focus on the role of religion in the political participation and mobilization of immigrant groups in a transatlantic perspective (Europe-North America). The leading question, of the workshop is: what role does religion play in the political participation and mobilization of immigrant groups in European and North American cities? We don’t want to focus on Muslims but consider Catholics, Protestants, and religions as well as non-religious faith such as secularism. The papers should cover in priority one of the following topics possibly in a comparative perspective. However, other topics proposed by the applicants will also be considered. The ways in which migrants become involved in labour markets of destination countries and regions has been a consistent focus of academic enquiry since at least the 1970s. The resulting literature has focused on two related questions: how should migrants’ integration into labour markets be measured and what are the main determinants of that integration. Both questions highlight the complex, dynamic relationship between labour markets and migration. They relate to broader theoretical concerns such as dual labour markets, social capital and segmented assimilation. They also highlight the often contradictory impulses driving migration policy, where labour market dynamics are a significant motivation for greater openness in migration policy, but also a key area of policing in enforcing migration restrictions. The turn to a wider range of migrant groups in approaches to labour markets, such as refugees or temporary, undocumented, intra-European, or return migrants, brings new empirical focus to these questions. As Europe emerges from economic crisis, this workshop seeks to review the long history of labour market integration and examine recent research on these issues. This one day workshop is organised under the auspices of the Integrim Network (Integration and International Migration: Pathways and Integration Policies), funded by the EU through FP7. We are particularly keen to receive abstracts presenting new empirical research, applied policy work and comprehensive reviews of the long development of approaches to the labour market integration of migrants. Thursday June 18th 2015, University of Sussex, Brighton, room C333. 1. Nina Sahraoui, London Metropolitan University, UK. 2. Iulius-Cezar Macarie, Central European University, Budapest, Hungary. 3. Salah Mahdi, Economist in Riyadh, Saudi Arabia. 1. Jill Ahrens, University of Sussex, UK. 2. Yannu Zheng, Olof Ejermo and Lennart Schön, Lund University, Sweden. How do different types of immigrants in Sweden perform in inventive activity? 3. 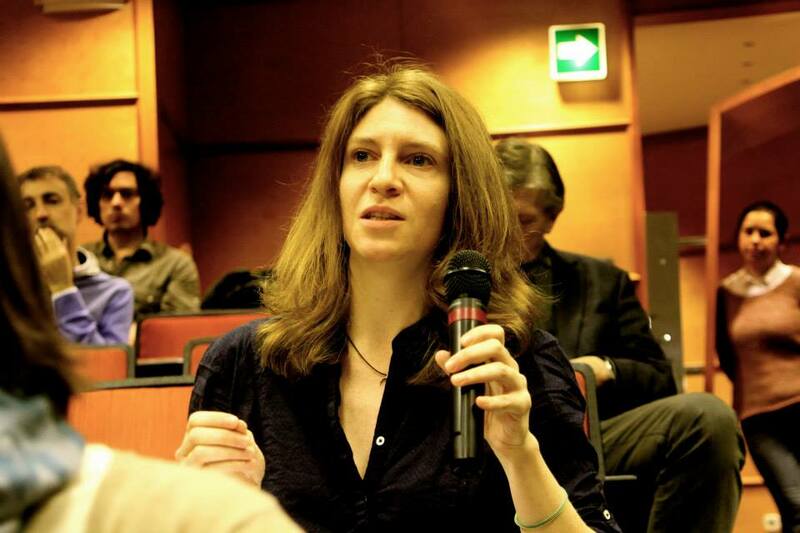 Raluca Nagy, Université Libre de Bruxelles, Belgium. 1. Katarzyna Kozien, Trinity College Dublin, Ireland. 2. 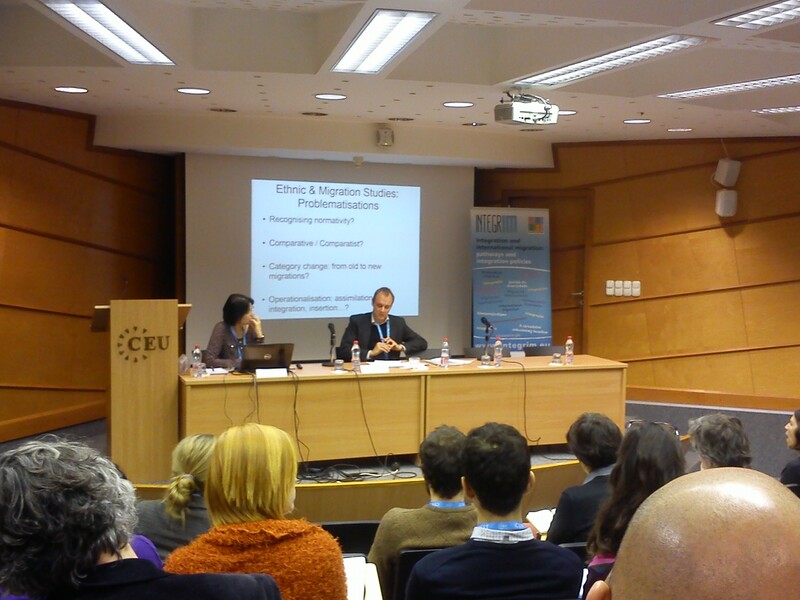 Davide Calenda, European University Institute, Florence, Italy. Migrant health professionals: Should they stay or should they go? 3. Mateusz Karolak, University of Wrocław, Poland. Cities as the main recipients of international migrants have tended to play a leading role in integration on the ground. The concept of integration, in analytical and policy terms, has been reflexively questioned in the light of increasing urban diversity, new migration patterns and the economic crisis. As cities are transformed through ongoing migration they face new and multiple challenges across sectors from assuring equal access to services, promoting labour market participation, fostering community participation and social cohesion, mitigating urban conflict and promoting urban planning that assures equal right to the city for all citizens. The increasing diversity of city dwellers calls for new ways of conceptualising and measuring integration. This workshop aims to stimulate debate on dominant perspectives on integration in the context of changing realities taking into consideration both policy and migrant perspectives. This two day workshop will be opened by two lectures by Prof. Rinus Pennix (University of Amsterdam) and Prof. Izhack Schnell (University of Tel Aviv). The first day will close with a roundtable discussion among academics and policymakers. Participants include Dr Maria João Hortas (ESE/CEG-IGOT), representatives of the Social Inclusion Unit, of The Aga Khan Foundation, The Municipal Council of Sintra and Lisbon and the High Commissioner for Migration. Participants are invited to take part in a study visit of immigrant neighbourhoods in Lisbon on the second day of the workshop. We welcome abstracts from PhD students and early scholars working on related topics. Please send your abstract to Jennifer McGarrigle (jmcgarrigle@ceg.ul.pt) by 30th April. 9.45-10.45 The concept of integration in empirical research of integration processes and in the study of integration policies, specifically local integration policies in Europe. 11.15-12.15 A model for the analysis of socio-spatial integration versus segregation. 14.00-14.30 Group concentration and collective violence in the city. 14.30-15.00 The various meanings of immigrant integration policies and programs in Israeli peripheral towns. Sandra Almeida, Aga Khan Foundation; Paulo Jorge Vieira, Alto Comissariado para as Migrações e o Programa Escolhas; Dr Maria João Hortas (CEG-IGOT/ UL). The Center for Policy Studies hosted and helped organize a documentary filmmaking training course for young academics from the INTEGRIM and ChangingEmployment Marie Curie Initial Training Networks. The MCN Film School was an intensive two-week training program in documentary film-making for Junior Research Fellows of the ChangingEmployment and INTEGRIM Marie Curie Training Networks. It aimed to provide the theoretical grounds for the role of visuality and film in social research; to offer a practical training in documentary film-making; and to supervise the development of visual projects developed by the members of the networks at all stages of production. 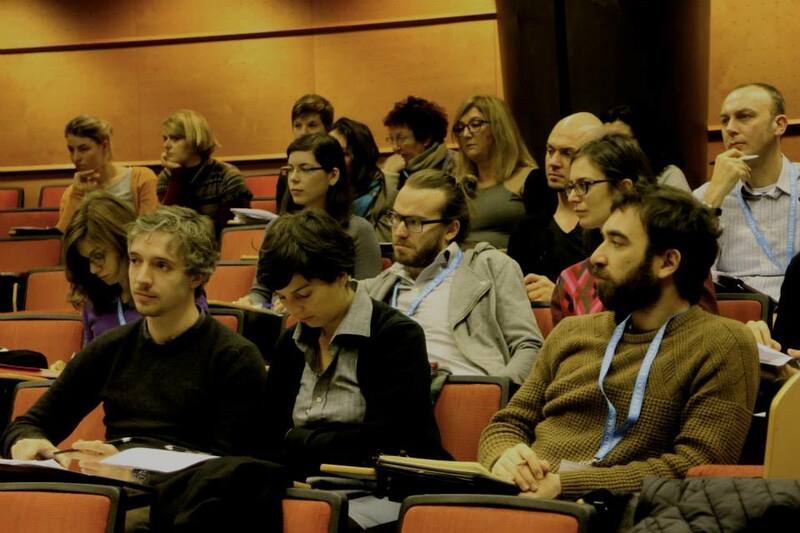 It was taught by Vlad Naumescu, professor of visual anthropology and ethnographic methods at the Central European University, and Klara Trencsenyi, freelance director and cinematographer, both authors of the documentary film “Bird’s Way” (http://goo.gl/uXmZxq). During the second week they were supported by the Czech director, writer and editor Šimon Špidla (http://goo.gl/eByRM6). The Migrations network is pleased to invite you to submit papers for its second annual seminar hosted by Migrinter at the University of Poitiers, France on 16 and 17 June 2015. At this occasion, we will be addressing migration experiences through the speeches of those primarily affected, and through the mechanisms that shape these experiences. These two days will also be partly dedicated to the network life and to foster a space of informal discussion for researchers in migration studies. For the participants presenting papers or posters, funding opportunities are available (kindly contact: logistiquereseaumig@googlegroups.com). 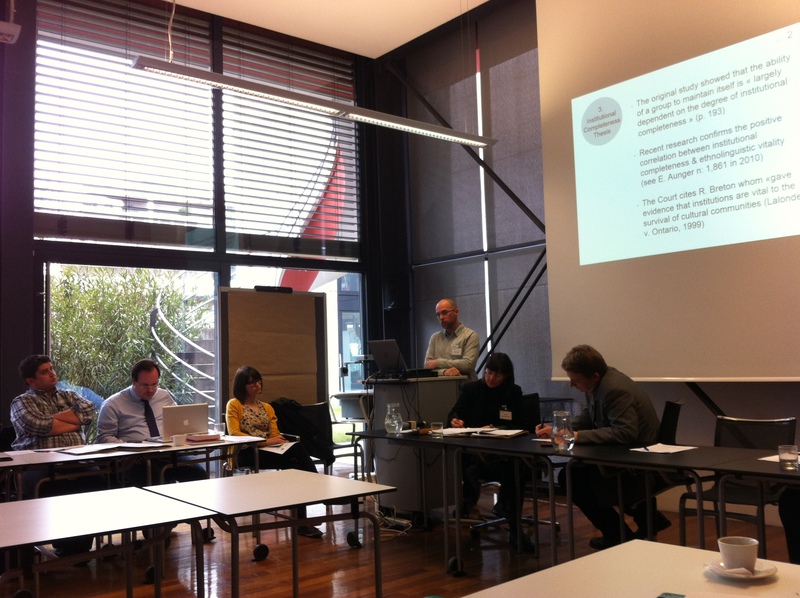 INTEGRIM was at the workshop for researchers and practitioners “PROTECTING AND INCLUDING ‘NEW’ AND ‘OLD’ MINORITIES: OPPORTUNITIES, CHALLENGES, SYNERGIES” organized by Roberta Medda-Windischer (EURAC) in Bolzano/Bozen on February 27, 2015. 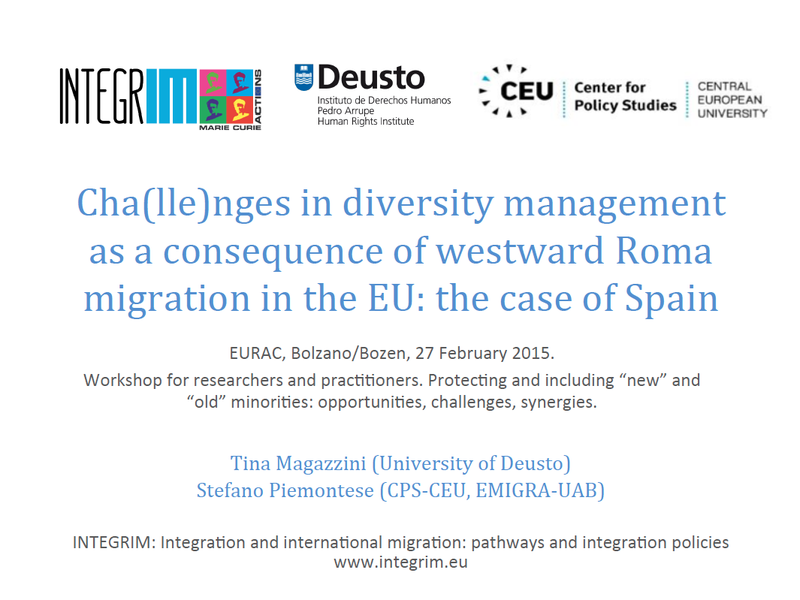 Based on their on-going PhD theses, the INTEGRIM research fellows Tina Magazzini and Stefano Piemontese presented a paper titled “Cha(lle)nges in diversity management as a consequence of westward Roma migration in the EU: the case of Spain”. The authors also drew upon findings from the 2011-2012 research project “Evaluating the Six Years of the Comprehensive Plan for the Roma Population in Catalonia” (EMIGRA and FAGiC) as well as from data collected during the workshop for scholars, policy makers, and NGOs “Bridging the Gap between Policy Making and Social Research. Strengths and challenges of the policies for Gitanos/Roma in Spain” (Barcelona, October 17, 2014) co-organized by Taller ACSA, the EMIGRA Research Group (Autonomous University of Barcelona) and the authors with the financial support of the European Academic Network on Romani Studies. Thanks to Roberta Medda-Windischer for this opportunity, and also to all participants for the feedback and the outstanding quality of their presentations! INTEGRIM network launches its third and last call for the recruitment of ESR. The Consortium is looking for 7 new ERS researchers who would ideally be PhD candidates who are already in advanced stages of their doctoral research and the elaboration of their thesis (applicants should have no more than 4 years of full-time research experience since obtaining the degree that entitles them to pursue doctoral studies). The programme offers them the possibility of enjoying a one-year-long research stay at one of the academic institutions of the network, either to improve their analysis or to develop the corresponding field work for their projects. 4. Urban integration, residential patterns and mobility. The ESR positions should ideally be assigned to PhD candidates who are already in more advanced stages of their doctoral research and the elaboration of their thesis (applicants should have no more than 4 years of full-time research experience since obtaining the degree that entitles them to pursue doctoral studies). The programme offers them the possibility of enjoying a one-year-long research stay at one of the academic institutions of the network, either to improve their analysis or to develop the corresponding field work for their projects. The Centre for Ethnic and Migration Studies (CEDEM) of the University of Liège is pleased to announce the third scientific thematic workshop organized by the working group Citizenship and Political Participation on “ Religion and the Political Participation and Mobilization of Inmigrant Groups: a Trasatlantic Perspective”. 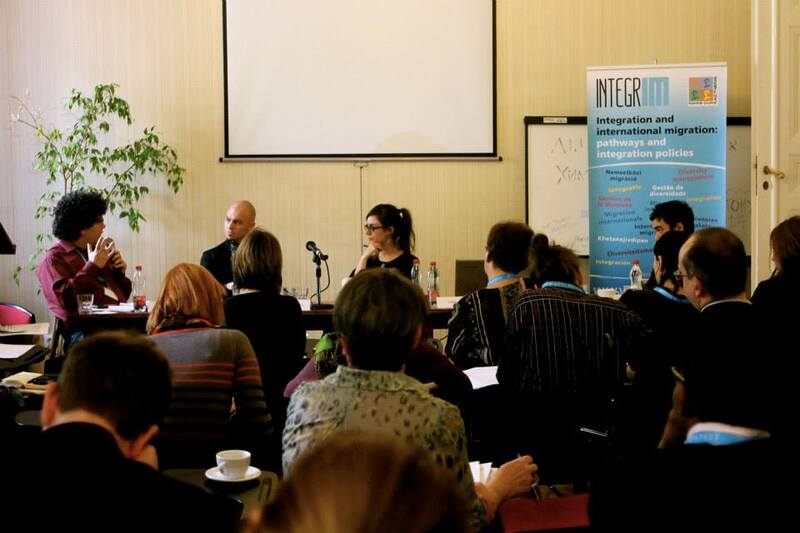 The second Annual Conference of the INTEGRIM Network took place between December 9-12, 2014 in Budapest, Hungary. The host and overall organizer of the series events within the Annual Conference was the Center for Policy Studies, Central European University, Beneficiary 7 of the INTEGRIM project consortium. The conference addressed empirical and conceptual opportunities and recent explorations in understanding how migration flows, policies, and debates relate, move, reveal or clash with other important discords in society. Competitive, cooperative, transformative, or mutually constitutive relations of marked ruptures in society were explored and explained. The field of migration studies has obvious cross-currents with interdisciplinary scholarship on social inequalities, regimes of citizenship, practices of social exclusion and inclusion, and other key concepts capturing pronounced or disguised social ruptures. Similar types of encounters characterize the field of Romani Studies, whereas the two fields have generated only thin crosscurrents until now. The conference brought together important scholars with the aim of promoting academic conversations across these two fields of studies and facilitating encounters of these two disjointed scholarly communities. 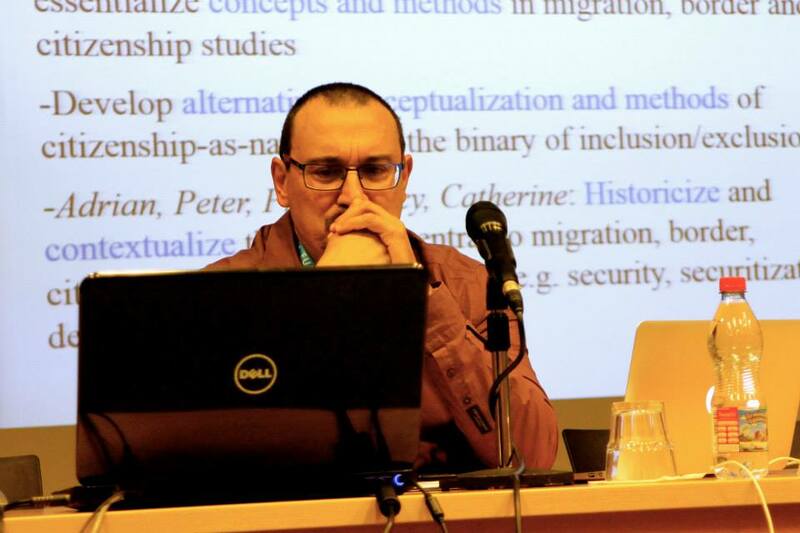 1) Adrian Favell, Professor of Sociology at Sciences Po, Paris, prepared a talk on “Immigration, integration and mobility: New agendas in migration studies.” Migration studies have exploded in recent decades, without always accumulating much wisdom. Via an overview of the changed landscape of migration and mobilities in Europe since 1990, his presentation discussed how these changes have challenged established paradigms of immigration and citizenship internationally, focusing particularly on the hugely problematic conception in policy and research of “integration”. 2) Catherine Neveu, from the Centre National de la Recherche Scientifique (CNRS), L’Ecole des Hautes Études en Sciences Sociales (EHESS, Paris, France), offered the talk “Of some of the benefits to be gained from de/recentering citizenship”. The abstract of the talk she shared with the audience is as follows: «Euro-American» assumptions for conceiving citizenship have long remained out of scope, and this does have effects as to the ways citizenship is conceived of and analyzed. There is therefore a need to disclose such implicit framings. If efforts to better grasp contemporary reconfigurations of citizenship require to pay attention to other ways to define and practice it (i.e. among postcolonial minorities or in non-Western sites), they especially require us to adopt new tools and standing points from which to explore citizenship processes, tools and standing points that should avoid to subsume the complexity of citizenship struggles to one or another theoretical “model”. In other words, the much needed destabilizing work in citizenship studies is not just about enriching the picture with views and practices that challenge established meanings; it is also about adopting a political and academic standpoint that reframe citizenship in general, and clearly contextualize it. Here the simultaneous move of recentering and decentering citizenship from its agreed connections and positions proves particularly fruitful. The study of the marginalization of undocumented migrants tends to focus on how states govern migrants in order to reinforce its sovereignty. These are important accounts, but the tendency is then to think the marginalization of undocumented migrants as being of a significantly different order to the marginalization of other groups or populations. In this essay Dr Rajaram argues that the contemporary neoliberal relation to politics, economy and the law in Europe cultivates surplus populations, amongst which are undocumented migrants and Roma. Their marginalizations, while each possessing singular features, is related to the marginalization of other groups surplus to neoliberal political economy. It is important to understand this common marginalization as part of an ongoing history of the relation between capital and labor. The paper focused on the various ways in which Roma appear as a subject in policy-related documents. In particular, Dr Vermeersch examined how frames emerging from Roma activism – and promoted by various stakeholders in the formation of policies on Roma on the European level – are reflected in EU policy-related documents. European policymakers seek out Roma to direct social assistance their way – but the Roma are also identified as a special group when states impose immigration control or extend security measures on them. While Roma activists have pushed for the Roma’s special position and legal recognition to alleviate the stigma of ‘Gypsy’ and make them a topic of concern in EU policy debates, new counterframes, in particular but not exclusively in the fields of migration and security, have stimulated and objectified the worrisome trend to see the Roma as a social group that is completely separated from national populations and do not share interests with other groups within these national populations. The focus of reflections on the formal political integration of migrants in democracies has often fallen onto the citizen/non-citizen divide. Certainly, in the contemporary world it would seem like the best path open for migrants to safeguard the civil, social, political, economic, cultural rights they enjoy in their countries of residence is to naturalize: that is, to acquire the citizenship (understood as nationality) of the country they live in. Yet, this focus on citizenship-qua-membership in a national community as the only path to formal political participation obscures and deactivates the potentialities of citizenship, which has historically referred to less and more than nationality. Dr Pedroza discussed these potentialities empirically, opening up the concept of citizenship for different meanings that can be activated by migrant residents to demand formal political inclusion beyond nationality. Migration and border scholars have convincingly argued that the Europeanization and securitization of migration and border policies in Europe have led to practices and techniques of population management that constitute a questionable divide between EU and non-EU groups, as well as between different non-EU populations. Dr van Baar built on this debate, and argued that these securitizing processes and transnational governmentalities have also impacted on the under-researched, ‘intra-EU’ divide regarding irregularized EU citizens, such as Europe’s Muslim and Roma minorities. Consequently, these minoritized, religionized and ethnicized groups have been faced with, for instance, having the adequate exercising of their citizenship – including their right to free movement in the EU – impeded. Dr van Baar focused on the position of the Roma, and on how the post-1989 Europeanization of their minority status – including the institutionalized promises for European citizenship and ‘integration’ – ambiguously relate to the securitization of migration and borders in Europe. 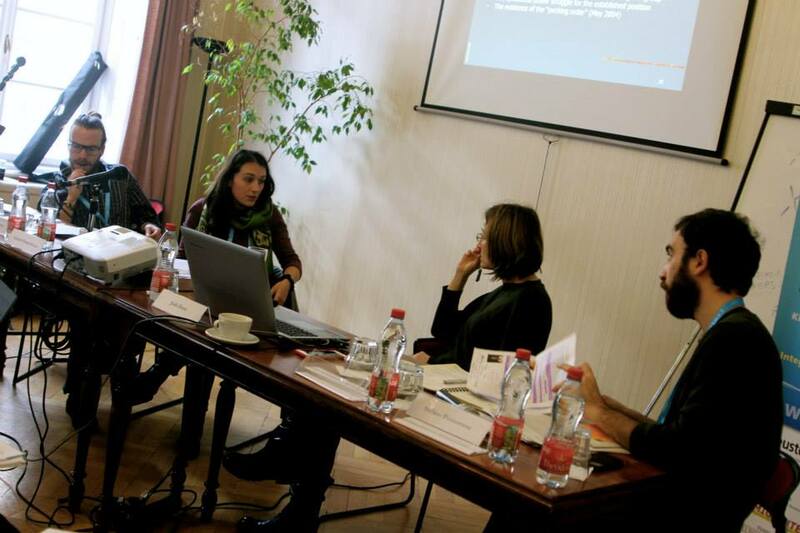 He discussed several intra-EU mechanisms and practices of bordering and policing and showed that these securitizing processes affect not only migrating Roma – including those who have fled and asked for asylum – but also many other Roma, particularly the poor and segregated, who are confronted with both forced mobility and forced immobility. Dr van Baar argued that new border practices have increasingly been articulated at sites, such as banlieues, ghettoes, settlements, and poor, ‘colored’ neighborhoods, that are considered as ‘dangers’ to both the state project and the newly devised European project. He reflected on how the continued representation of the Roma as irregular migrants and citizens – particularly through their problematization as ‘rootless nomads’, ‘itinerant criminals’ and ‘undeserving citizens’ – has led to confronting many Roma with forced mobility and to a situation that calls into question the political articulation of freedom of movement in contemporary Europe. The Multicultural/Intercultural (Mc/Ic) emerging controversy resides in the logic of the necessary requirements to manage a society that recognizes itself as being diverse. The great multicultural debates of the late 20th century, and even in the early 21st century, followed a script driven by a cultural right-based approach of diversity, centered on such questions as the cultural recognition of rights in the public sphere and how to re-assess equality and cultural rights of non-national citizens coming with different attributions of language, religion, and cultural practices. This focus to diversity has founded the multicultural citizenship studies until the emergence of a new paradigm that is taking shape in this second decade of the 21st century: intercultural citizenship. Interculturalism invades this negative diagnosis of multiculturalism as a lifeguard costume. But it is also true that even if we are in an “intercultural turn”, there is still no political theory founding this turn. It is within this framework that Dr Zapata-Barrero explored the building blocks of a preliminary theory, having Europe as main contextual framework. According to him, to look for the foundation of interculturalism we need to identify some substantial criticisms of multiculturalism that has been deployed this last decade. Dr Zapata-Barrero entered into this foundational frame of discussion taking citizenship as main focus. The Dec 11 conference was planned, designed and convened by Viola Zentai, Director of the Center for Policy Studies at Central European University. At the end of the day, Paul Statham of the University of Sussex offered the final session reflecting on the themes and currents of the talks and presentations offered. Sonia Gsir (University of Liege, Belgium) and Lucinda Fonseca (University of Lisbon, Portugal) facilitated by chairing the morning and afternoon sessions. Floris Vermuelen (University of Amsterdam, Netherlands), Michael Collyer (University of Sussex, UK) and Dolores Morondo Taramundi (Deusto University, Bilbao, Spain) contributed to the sessions by acting as discussants for the presented talks and papers. The conference greatly benefited from the participation of the senior scholars from the INTEGRIM Network, and was attended by an international audience of approx 100 participants. 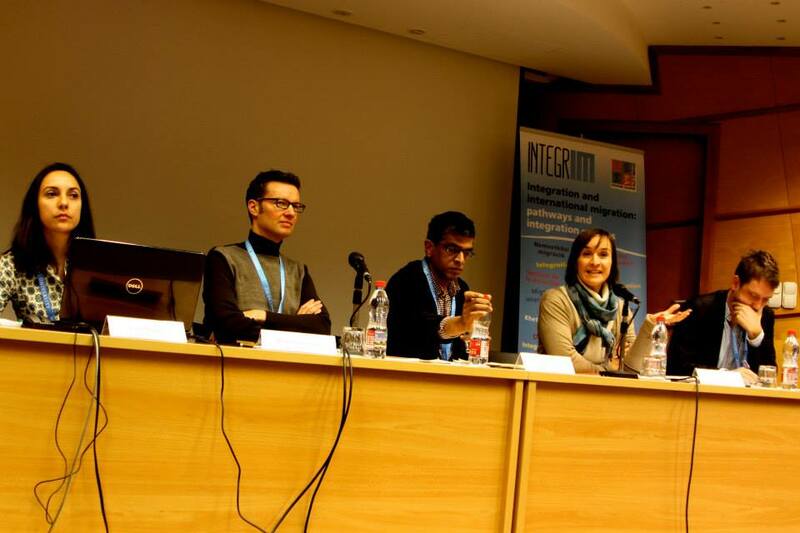 The second Annual Conference of the INTEGRIM Network took place on December 9-12, 2014 in Budapest, Hungary. The host and overall organizer of the series events within the Annual Conference was the Center for Policy Studies, Central European University, Beneficiary 7 of the INTEGRIM project consortium. The aim of the workshop was to bring senior and junior scholars together who work on topics related to various aspects of migration, Roma, and Roma migration. Roma migration has been increasingly in the focus of scholarly interest as Roma, generally losers of the transition from state-socialist economies to capitalism, started to migrate from poorer regions and countries to wealthier ones as part of their survival strategies under the new circumstances. In the last two decades the migration process has been varied both with regard to its extent and composition of migrants. For many years, Roma have sought refugee status in Western European countries but were turned away, however, with the opening up of the labor markets and /or borders for new member states, migration intensified and brought about intense political and social rejection in several EU member states. The process raises a number of new questions both in sending and receiving countries concerning migration. The workshop was planned to be genuinely interactive: senior scholars working on Roma migration presented their work while junior scholars (INTEGRIM Early-Stage Researchers) studying other migration related topics acted discussants. The workshop aimed to generate a fruitful debate between senior and junior scholars on the one hand, and link the conceptual, theoretical and empirical experiences of ‘migration research’ and ‘Roma migration research’, on the other. 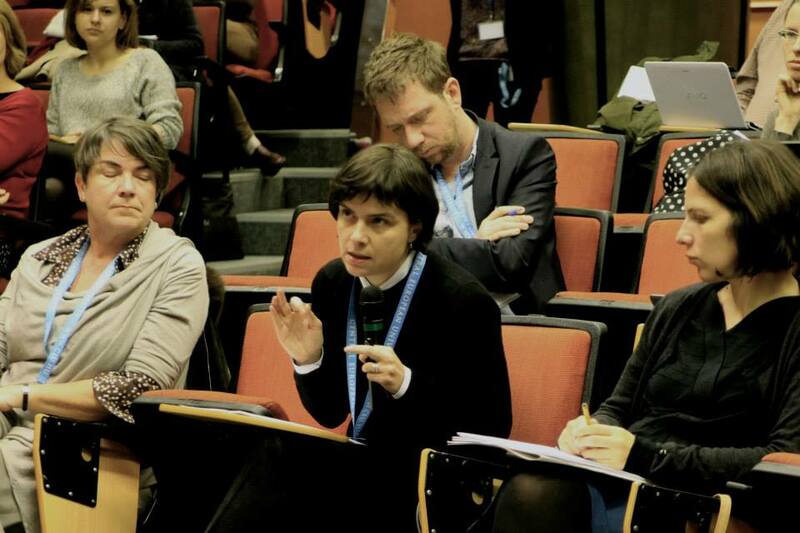 The workshop was planned, designed and convened by Vera Messing and Zsuzsanna Vidra, both Research Fellows of the Center for Policy Studies at Central European University (Budapest, Hungary). The workshop served as a great opportunity for INTEGRIM early-stage researchers to actively take part: Tina Magazzini (University of Deusto, Bilbao, Spain) and Stefano Piemontese (Center for Policy Studies, Central European University, Budapest, Hungary) chaired the sessions and offered a comprehensive framework for the workshop, while eight ESRs acted as discussants of the presented papers. This project has received funding from the European Union's Seventh Framework Programme (FP7/2007-2013) under grant agreement n° 316796.